Exede's Liberty plans offer download speeds up to 25Mbps. $69.99 a month for 24 months. $99.99 a month for 24 months. $149.99 a month for 24 months. Exede offers a VoIP phone solution that can be bundled with their satellite internet packages for $29.99/mo. Exede offers an additional layer of support called Easy Care, which can be added to all plans for $5.99/mo, but the first 3 months are free. This gives you priority support when you call in and covers additional technical support fees, if an installer needs to be sent back out for your service. ViaSat was founded in 1986 by Mark Dankberg and has since grown into a global leader for broadband services and satellite technology. Dankberg came up with the idea for the company along with his two partners, Steve Hart and Mark Miller, in a spare bedroom in his home. All three still act in key roles within ViaSat, with Dankberg as Chairman and CEO, and Hart and Miller as executive VPs and chief technical officers. When Dankberg first started ViaSat, his main focus was as a consultant for defense contractors, specifically in the area of satellite communications. ViaSat aided the U.S. Military, the government, Boeing, and multiple enterprise companies. After successfully helping these companies develop products, ViaSat won a contract with WildBlue to help develop their ground network. From there, ViaSat played a key role in the advancement of satellite internet, with the biggest accomplishment being satellite connection in any geographic place. In 2008, ViaSat announced plans to launch a high capacity satellite of it's own, which would improve upon current satellite speed and coverage areas. ViaSat acquired WildBlue the next year to combine ViaSat's satellite knowledge with WildBlue's customer and business expertise. There are four ViaSat Services under the Exede brand: Exede internet, Exede Business, Exede Voice Home Telephone Service, and Exede Enterprise Satellite Service. ViaSat launched their first satellite, ViaSat-1, in 2011 over North America. This was the largest satellite at the time at 140 Gbps and won a Guinness World Record. WildBlue changed its name to Exede in 2012 and continued using ViaSat's satellite capability to improve its services. That same year, ViaSat announced that Exede Internet would now be available on JetBlue flights and by 2015 more than 400 planes had in-flight internet. ViaSat-2 launched in late 2016 and is the world's highest capacity communication satellite. The purpose of this satellite is improve service in North America, parts of South America, Caribbean, and the Atlantic Ocean. Since ViaSat's inception, the company has been recognized multiple times for excelling in technology, innovation, satellite development, and overall business strategy. Some of the biggest awards in the company's history include #1 Internet Provider from the FCC, Industry Innovator award from the Society of Satellite Professionals International, and Forbes Magazine Top 200 Best Small Companies 5 times. How much is Exede Satellite Internet per month? Depending on your plan, Exede offers internet plans that range from $49.99/mo to $149.99/mo. 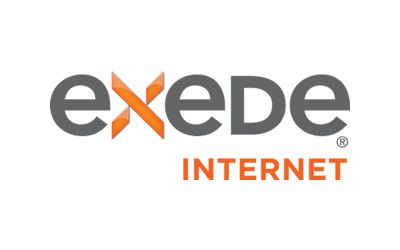 What type of internet service does Exede offer? Exede provides customers with satellite internet connections. When you visit your favorite websites, a request is sent to your modem and then down a wire to your dish outside. The dish then sends the signal to a satellite, which then transfers it to one of Exede's ground networks. The network is then able to read the request and send it back to your computer through the satellite. How fast is Exede internet? Exede offers their customers download speeds, which range from 5 Mbps to 15 Mbps and upload speeds between 1 Mbps to 3 Mbps. In some areas, Exede is able to deliver download speeds up to 25 Mbps. Their standard speeds allow customers to browse the internet, check emails, more. Areas that are able to achieve 25 Mbps in download speeds can stream videos and download larger files with ease. How much data do I get with Exede? Depending on your plan, data caps range from 10 GB to 30 GB. Exede's Liberty Plans come with the Liberty Pass, so you don't have to worry about going over your data allowance. If you do pass your monthly data limit your speeds are reduced within the range of 1 Mbps to 5 Mbps, but you do not lose service. If you choose the Essential 10 plan, you have unmetered data between the hours of 3 a.m. and 8 a.m. Additionally Exede allows you to buy more priority data month to month for $9.99 per 1 GB of data. How much does Exede cost? Exede has introductory prices that range between $39.99 to $99.99. However, after three months they do have a price increase for three out of their four plans. The prices then range from $49.99 to $149.99, which is the price you will be able to lock in for three years. There are also additional savings, when you bundle your internet package with DirecTV. What hardware do you need with Exede? When you choose Exede for your satellite internet service you will need a satellite dish and a modem. A licensed technician will perform a professional installation of everything for you and the process usually takes between 2-3 hours. Exede is ranked #3 of the largest provider in the U.S., in terms of availability to customers. Exede offers Internet service to approximately 319,746,556 people in 3,208 counties over 49 states. All Exede plans require a 24 month commitment. If you cancel your Exede service before the end of the 24 month period, the termination fee is equal to the number of months left in your contract multiplied by $15.00 unless a different termination fee is stated in this Agreement for your Internet Service plan. High Speed Satellite Internet by Exede is Available Everywhere!